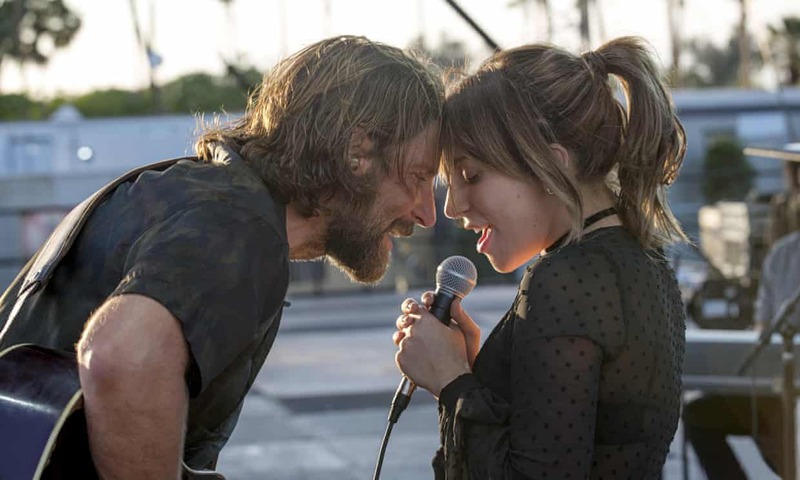 What an absolute surprise to find that Bradley Cooper's remake of A STAR IS BORN is so well-made, so well-acted, so desperately moving and watchable! I approached it with caution, a sense of wonder that it was necessary at all, but all my fears were over-turned by this beautifully naturalistic, painfully raw depiction of an ingenue tragically in love with a traumatised, alcoholic old showman. As in the other versions of the film (see below) the film begins with a meet-cute between the two artists. The first is the alcoholic country rock star Mason Craine, played by a grizzled Cooper, and fairly close in tone to Kris Kristofferson's interpretation of the role. Cooper adopts an accent that's so deep and southern I sometimes struggled to hear him through his mumbling, but later realised this was to make his being Sam Elliott's younger brother credible. It's a superb impersonation. Cooper doesn't hold back at all from showing the true depths of drug abuse and depression, and the rare moments when his eyes light up seeing Ally (Lady Gaga) sing are genuinely delightful. We know that, as in other versions of the tale, he isn't jealous of her at all. Rather it's a relationship founded on the idea of a jaded, cynical, weary man, falling in love with is art again through the genuine joy of his protégée making the same journey he once did. I utterly believed in his character, and despite knowing how every beat would play out in this version of the film so faithful to the 1976 predecessor, I was genuinely tense at the set pieces. And I really loved the fact that movie shifted its centre of attention a little from the leading lady to the man's story. Kudos to Cooper as screenwriter for giving us this backstory. Lady Gaga is truly a revelation as Ally (the screenwriters have finally ditched the name Esther - a shame!) Stripped of the make-up and bleach blonde hair of her stage persona, Lady Gaga is truly beautiful, and delivers a performance of real nuance, strength and charisma. But there's an added bizarre-o aspect as we see Gaga essentially act out the beats of her own career - the first experience on a big stage, the first Grammy nominations. There's also a meta discussion about Ally refusing to "pretty up" and then acquiescing to further her career. In all this I remain surprised that Gaga herself, reflecting on her experience making this film and how stunning she looks on screen, continues to market herself as a persona. After all, she is not credited under her actual name but as Gaga. And she went back to blonde as soon as the film was over. The meta narrative continues with a final reflection from Mason Craine - that the artist only plays with the same 12 notes over and over, and all he can do is offer up to the world his interpretation of them. This is essentially what Cooper is doing with this well-worn material. But in centring it on a story of childhood trauma, rehab, youtube videos and SNL sketches, he has both made it contemporary and more profound. A STAR IS BORN is rated R and has a running time of 136 minutes. It is on global release.